This is the one. This is the poke cake of all poke cakes. I mean…. I just have no words. Last year I paired pumpkin and Nutella together in a fudge, and it absolutely rocked my world. So I’ve been impatiently waiting and toe tapping for the seasonally appropriate time to start back up where I left off with pumpkin last year! Given my great love for poke cakes, this seemed like an excellent recipe to start with. Aside from how yummy this cake is, I really love how easy it is to make. 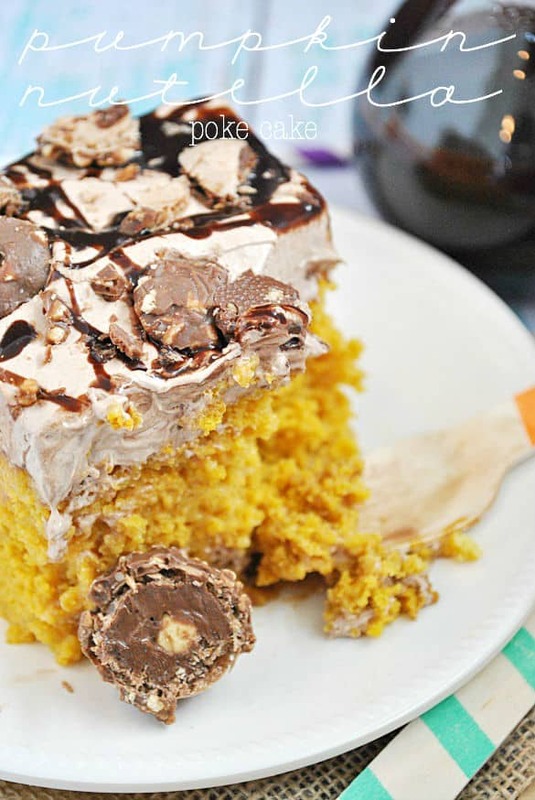 It’s made of 3 parts (cake, frosting, toppings), and each part is only 2 simple ingredients. The cake is just a boxed yellow cake mix plus a can of pumpkin. The frosting is Nutella and Cool Whip. And the toppings hot fudge sundae sauce and chopped Ferrero Rocher chocolates. So easy. Oh… and I guess you have to work the hole poking and sweetened condensed milk in there too, but what effort really goes into that? Just poke some holes, pop open the can and pour! Voila! Do me a favor? Promise me you’ll try this sometime this season. I mean it. 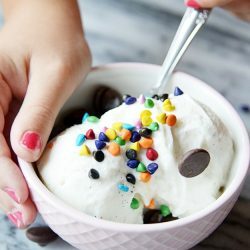 You’re just going to die at how yummy this is! And by the way… Happy Pumpkin Season everyone!!! Preheat oven to 350 degrees F. Grease a 9x9 baking dish. Set aside. In a large mixing bowl, mix together the cake mix and canned pumpkin until a batter forms. Scrape the batter into the prepared baking dish, and bake for 35-45 minutes until a toothpick inserted comes out clean. Poke holes evenly through out the cake using a fork or the base of a wooden spoon (which is what I use, because I like bigger holes). Pour the sweetened condensed milk over the cake, aiming to fill the holes. Set aside. In a large mixing bowl, whisk together the Nutella and Cool Whip. Spread this mixture over the cake. Cover and chill cake for at least 4 hours, overnight if possible. When ready to serve, top with chocolate sauce and chopped Ferrero Rocher chocolates. Add 1 teaspoon of pumpkin pie spice to the cake batter for a more "pumpkin-y" taste! Girl this looks and sounds so good! I love that it’s already a new fave for you. With the pumpkin, I’m sure it’s so moist. And the Nutella…oh boy. Pinned! Someone needs to invite me to a party real soon so I can make this! It would completely dangerous to have this all to myself at home!! Yup…now I’m drooling! This cake looks seriously amazing! Totally pinning this one! I love the smashed up ferrero rocher. I bet that lends a lot of fun to the texture. This sounds awesome. 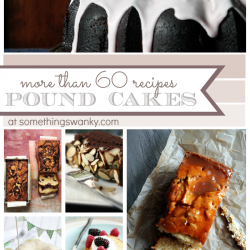 I pinned this on the post title alone…and then I got down to your pictures and ingredient list. Seriously, my mouth is watering. Holy moly, this looks so crazy good, Ashton! So I’m not the only one that counts down the days until it’s no longer considered weird to have pumpkin! This cake looks delicious! Pumpkin plus Nutella equals the love of my life. So excited for autumn slash pumpkin season! This cake . . . I can’t even?! Totally making this for our little family thanksgiving this year no question! Well maybe one question . . . so you just mix the cake mix with the pumpkin puree and bake? Nothing else? No eggs, milk, oil required? Just cake mix and pumpkin puree? 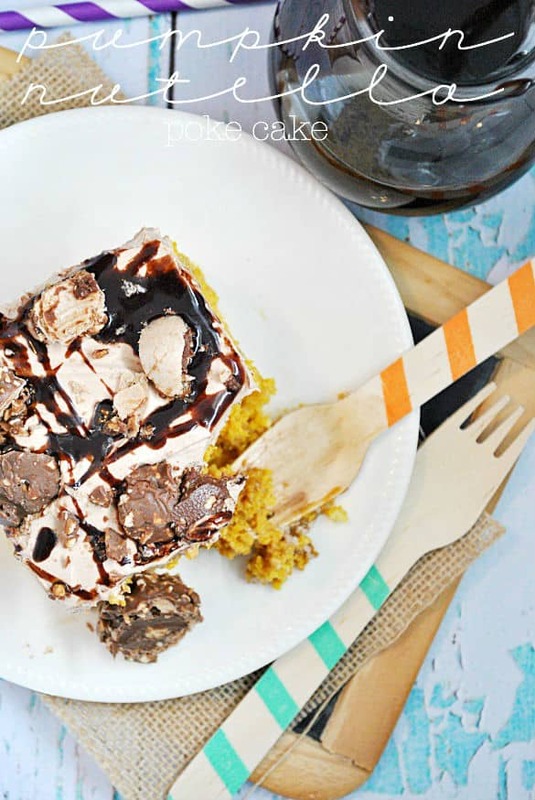 Yep, pretty much the best poke cake ever! I love pumpkin and hate pumpkin pie! I have to make this for Thanksgiving! And maybe next week too, just to test it out! Oh Ashton! This is incredible! Thanks for sharing! Ashton!! This looks amazing!! There are just no words!! I am unable to resist anything pumpkin AND anything Nutella!! This is one amazing poke cake Ashton! The best I’ve ever seen. I love Nutella and pumpkin together! What a great combination for a poke cake! Love it! Oh my goodness. 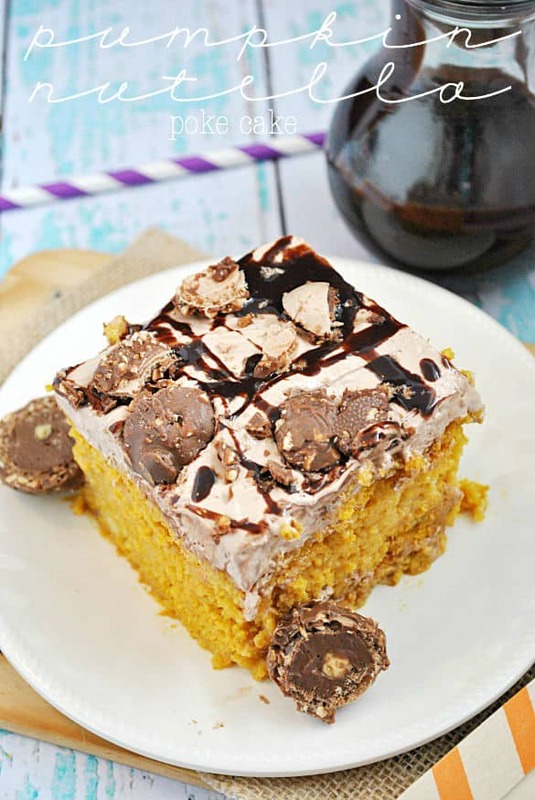 Nutella fudge on top of pumpkin cake! 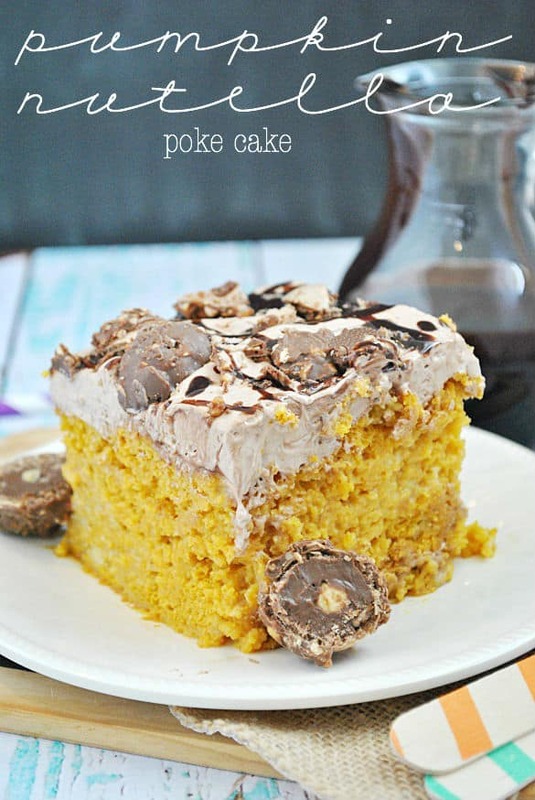 I had no idea what a “poke cake” was before this, but I am definitely trying it now. YUM! This looks great. Another idea to make the cake more pumpkin-y tasting would be to use a spice cake mix. I use that when I make pumpkin cookies and it works great! I’m excited about this combo! I have the cake in the oven now. I only had a chocolate cake mix so I used it. Hope it tastes as good as it smells!! I made this cake for my family’s Thanksgiving dinner today, and while it was tasty, it becomes cloyingly sweet very quickly. If the only need for the sweetened condensed milk is for moisture, I’d suggest halving or even quartering the amount called for. When I cut into the cake I would come upon the “poked” areas where the condensed milk was blobbed and not fully absorbed, and imo, that was kind of gross. I think this cake might be even better with no condensed milk or some other liquid, coffee maybe? Not sure how those flavours would work together. Anyhow, it *is* an easy cake to put together and was good in teeny tiny portions! Whatever works for ya! This recipe is based off of the classic BTS cake, which is a lot like Tres Leches :) But, by all means, decrease the sweetness if you’d like! Sometimes I also sub in pudding or hot fudge sauce or caramel sauce (although– if you’re looking for less sweet, those may not be great options). Pudding sounds like a great idea! Perhaps 1/2 a can of evaporated milk? Or just regular milk for the moistness? Or would that make it too runny? I have made chocolate caramel poke cake 3x and love it. For the icing I have mixed Cool Whip with a package of instant chocolate pudding and it is perfect. 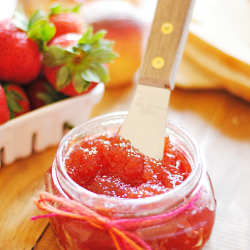 I have also tried mixing it (very well) with a package of softened cream cheese (also super good and not overly sweet). Then I top it with crushed Butterfinger. YUM! This sounds and looks amazing! One question tho… a 9×9 dish or a 9×13?? Thanks!